Practice the third grade math worksheet on lines, line-segment and ray in geometry. The questions will help the kids to understand the basic concept of point in geometry; lines; types of lines such as straight line and curved line and comparison between a ray, a line and a line segment. 1. What is a point in geometry? 3. How many types of straight lines do you know? (i) A point has the smallest but definite mark. 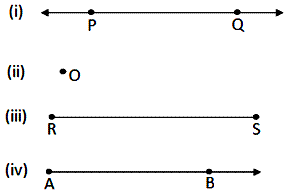 (ii) A line-segment is a part of line. (iii) A ray has no definite end point. (iv) There are no points in a line. (v) a slanting line is a kind of curved line. 6. Compare a ray, a line and a line segment. 7. How many rays are possible through a given point? 8. How many line segments can be drawn through two given points? Answers for the worksheet on lines, line-segment and ray are given below to check the exact answers of the above questions in geometry.